Choosing the best sunscreen for your skin type, geographic location, and outdoor activities is important. 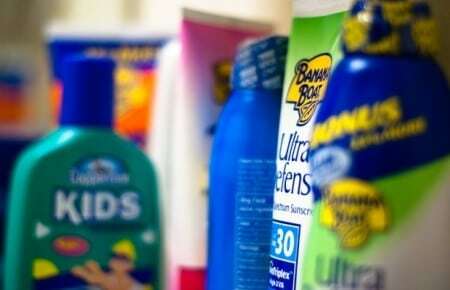 But with so many brands and options, how do you choose the best sunscreen for you? Protecting yourself against ultraviolet (UV) radiation is critical to maintaining your health and preventing skin cancer. The best way to do so is to stay out of the sun—but you can’t stay inside all the time. When you do venture out, no matter the season or time of day, wearing sunscreen is important to stop premature aging and lower the risk of developing skin cancer. Unfortunately, medically sound information about sunscreen can be hard to come by. 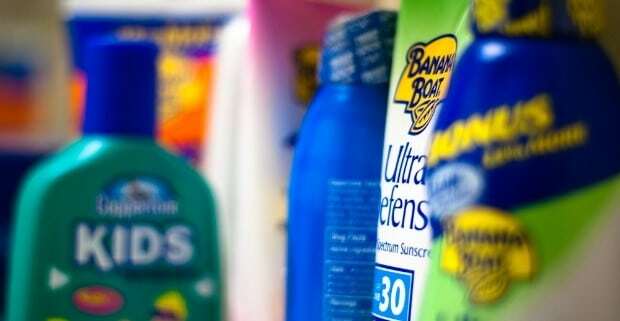 With all the marketing and misinformation, it can be difficult to choose the best sunscreen for you. In choosing the right sunscreen, it helps to understanding some basic principles about how sunscreen does its job. Reflection. Some sunscreens form a reflective layer on top of your skin that scatters UV rays away from your body. Absorption. Some sunscreens absorb UV rays, stopping them before they make contact with your skin. UVA radiation penetrates your skin to the deepest layer. UVA rays don’t cause sunburns, but are responsible for a suntan. For a while, it was believed that UVA rays did not play a role in causing skin cancer, although many doctors now believe this to be untrue. We do know, however, that UVA causes signs of aging, such as wrinkles. SPF is a scale designed to rate the level of protection a sunscreen provides against UVB rays. The higher the SPF, the more protection the wearer has against sunburns. SPF does notprotection against UVA rays. Most doctors believe that there is little additional value to any SPF rating above 30. Despite the fact that doctors are unsure about the role UVA plays in the development of skin cancer, most recommend a broad-spectrum sunscreen. Broad-spectrum sunscreens protect against both UVA and UVB rays, safeguarding against sunburns, skin cancer, and premature aging. Ingredients. Buy broad-spectrum or multi-spectrum sunscreen to protect against UVA and UVB rays. 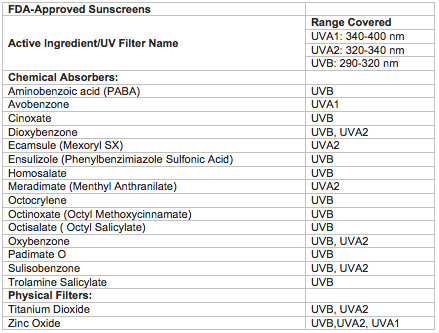 Consult the chart below to see if the ingredients in your sunscreen of choice protect against both types of radiation. Since there is no rating for UVA protection, you’ll have to make sure that the proper ingredients are included. Sun Protection Factor. Use a sunscreen with a minimum of SPF 15. For people with fair skin, a tendency to burn easily, or a family history of skin cancer, use SPF 30. Resistance to water and sweat. Since you’ll be out in the sun, it’s a good idea to wear sunscreen that won’t come off upon contact with liquids like sweat. This is particularly important if you’re swimming. Keep in mind: there are no water-proof sunscreens. According to the FDA definition, water resistant sunscreen is sunscreen that will remain effective for up to 40 minutes in the water. If you plan on swimming, you’ll need to reapply at least every 40 minutes, and the same goes for sweating. Fragrance and feel. Some people like strong-smelling, fruity sunscreens. Some people like the odorless kind. Some people feel greasy unless they buy an expensive, Regardless of your preference, make sure to choose a sunscreen you like—otherwise you’re less likely to wear it. Non-sun related applications. If you suffer from skin conditions such as eczema or rosacea, you may find sunscreens designed for sensitive or damaged skin. There are sunscreens designed for people with allergies to certain ingredients, particularly those related to fragrances and preservatives. You may also find sunscreens with moisturizers to help those with dry or oily skin. Wear sunscreen with an SPF of at least 15. If you plan to be outside between 10 a.m. and 2 p.m., or live near the equator, or have fair skin, your minimum SPF should be 30. Make sure to apply the sunscreen a half hour before sun exposure. Make sure to put on enough. For most people, this means applying a minimum of one ounce or around three tablespoons. Reapply your sunscreen! Once a day is not enough. Most doctors suggest putting on sunscreen every two hours. If you are swimming or being physically active, reapply more frequently. Check the expiration date. Sunscreen becomes less effective over time. Wear UV resistant sunglasses. The eyes are also susceptible to damage from the sun, including melanoma. Wear a visor or hat with a wide brim. How to Protect Yourself from the Sun What is Dysplastic Nevi (Atypical Moles)?